Tonight at 7pm ET/PT, 60 Minutes will air a controversial interview with Stephanie Clifford, aka Stormy Daniels, the adult-film star who says she had an affair with Donald Trump. Daniels will talk to Anderson Cooper about the relationship she says she had with Trump in 2006 and 2007, unveiling details that bring her story up to the present. It will be the first - and so far only - television interview in which she speaks about the alleged relationship. The 60 Minutes interview will include an examination of the potential legal and political ramifications of the $130,000 payment that Trump's attorney Michael Cohen says he made to Daniels using his own funds. Daniels accepted the money in return for signing a confidentiality agreement, although she recently violated the CA, claiming Trump never signed it. The president has denied having an affair with Daniels, while Trump's legal team - in this case led by Charles Harder who won a $140MM verdict for Hulk Hogan against Gawker - is seeking to move the case to federal court and claims that Stormy is liable for up to $20 million in damages. 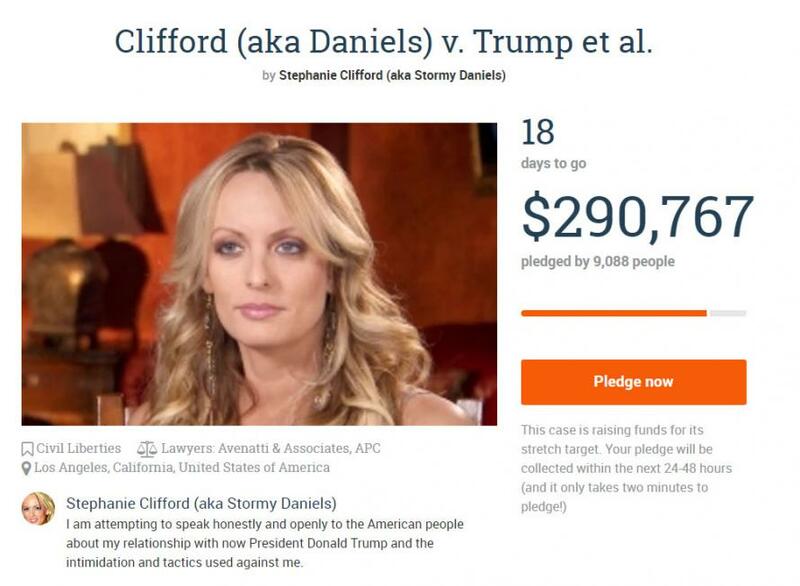 This in turn prompted Daniels to launch a crowdfunding campaign to fund her lawsuit against Trump, which at last check had raised over $290K. Cooper conducted the interview earlier this month, shortly after Cohen obtained a temporary restraining order against Daniels. Meanwhile, Daniels is seeking a ruling that the confidentiality agreement between her and the president is invalid, in part because Mr. Trump never signed it. The president's attorneys are seeking to move the case to federal court and claim Daniels is liable for more than $20 million in damages for violations of the agreement. On Thursday, the lawyer representing Daniels fired off a tweet with a picture of what appeared to be a compact disc in a safe - hinting that he has video or photographic evidence of Clifford's affair with President Trump. "If 'a picture is worth a thousand words,' how many words is this worth?????" tweeted lawyer Michael Avenatti. Avenatti has been a frequent guest on cable news as he promotes Stormy's upcoming 60 minutes tell-all about her alleged affair with President Trump. When CBS Evening News' Julianna Goldman asked Avenatti if he had photos, texts or videos of her alleged relationship with Trump, he replied "No comment," adding that Clifford just "wants to set the record straight." (which you can read more about in her upcoming book, we're sure). Previewing today's 60 Minutes segment, Avenatti purposefully built up the suspense, tweeting that, among other things, "tonight is not the end – it’s the beginning"
1. Will she give details about the nondisclosure agreement? Daniels has never spoken publicly about the nondisclosure agreement that purportedly bars her from speaking about her alleged affair with Trump. But a lawsuit filed by Daniels earlier this month confirmed the existence of such a document, arguing that it is invalid because it was never co-signed by Trump himself. Whether Daniels will discuss the details of the agreement in the "60 Minutes" interview remains to be seen. Her lawsuit seeking to void the contract is still pending, and NDAs often prohibit signatories from speaking about the agreements. Daniels has hinted that is true of her NDA. During an interview with late-night host Jimmy Kimmel in January, Kimmel pointed out that Daniels would likely be barred from discussing the agreement if it, in fact, existed. "You're so smart, Jimmy," was her cagey response. 2. Will she talk openly about the alleged affair? Daniels has implied she was paid $130,000 by Trump's personal attorney Michael Cohen weeks before the 2016 presidential election to keep quiet about the alleged affair. Speaking openly about her claims would certainly violate the terms of the disputed NDA, and could subject Daniels to legal penalties. In court papers filed earlier this month, Trump's lawyers said that Daniels could face up to $20 million in damages for violating the terms of the agreement. One question that remains is whether Daniels could toss out the NDA completely in her "60 Minutes" interview, and provide details about her alleged relationship with the president. The last time she spoke about it was 2011, when she gave an interview to In Touch magazine that wasn't published until this year. 3. Will she mention possible video or photographic evidence? Avenatti has repeatedly hinted that video or photographic evidence of Daniels's alleged affair with Trump exists. The March 6 lawsuit filed by Daniels to void the nondisclosure agreement with Trump refers to "certain still images and/or text messages which were authored by or relate to" the president. While the NDA reportedly required her to turn over such material and get rid of her own copies, Avenatti has suggested that Daniels may have retained it. Avenatti hinted this week that he may be in possession of such material, tweeting a cryptic photo of a compact disc inside of what appeared to be a safe. "If 'a picture is worth a thousand words,' how many words is this worth?????" he wrote on Twitter. 4. Will she address whether she was physically threatened? Avenatti prompted questions earlier this month when he said that Daniels had been threatened with physical harm in connection with the alleged affair with Trump. Asked on MSNBC's "Morning Joe" whether Daniels had been physically threatened, Avenatti bluntly replied, "yes." Exactly who may have threatened Daniels or what the nature of those threats may have been is unclear, and Avenatti has declined to discuss the matter in greater detail. Daniels herself has not addressed any potential physical threats that she may have gotten, leaving open whether she will discuss the topic in the "60 Minutes" interview. 5. Will she discuss whether Trump knew about the $130K payment? Cohen himself has acknowledged making the payment to Daniels, but has insisted that the money came from his personal funds and that Trump was never made aware of the transaction. White House press secretary Sarah Huckabee Sanders has said she does not believe Trump knew about the payment. But Avenatti has argued otherwise, saying the fact that Cohen used a Trump Organization email address backs up his claim that the real estate mogul was aware of the transaction. In an interview on "Morning Joe" last week, Avenatti also suggested that he had more evidence that Trump knew about the payment. Asked by Willie Geist if his "belief that the president directed this payment is based on more than a hunch," Avenatti simply replied, "yes," but declined to provide any evidence. 6. Why does she want to talk about the affair now? Daniels's lawsuit claims she expressed interest in discussing the alleged affair publicly in 2016 after The Washington Post published a 2005 "Access Hollywood" tape in which Trump could be heard boasting about groping and kissing women without their permission. It was at this point that Cohen and Trump "aggressively sought to silence Ms. Clifford," according to the lawsuit, which claims that the $130,000 payment and nondisclosure agreement soon followed. But for more than a year after that, Daniels was silent about the alleged affair, and it was only in recent months that the accusations resurfaced. One thing to watch for is whether Daniels addresses her motives in the "60 Minutes" interview, or answers questions about what she hopes will happen next. There may be hints of what Daniels's next steps are in the interview. A planned court hearing for Daniels's lawsuit is still months away. However, whatever Daniels reveals in the interview may force the hand of Trump's own legal team. After news broke that CBS intended to air the "60 Minutes" segment with Daniels, speculation swirled that Trump's lawyers would take legal action seeking to block the broadcast. Such legal action would have been unlikely to proceed, because courts rarely allow such prior restraint of speech, particularly regarding the news media. But Trump’s legal team has already signaled they’re willing to fight Daniels on her claims. They reportedly asked for a temporary restraining order against her last month and have asked to transfer the lawsuit from California state court to a federal court in Los Angeles. But how Trump and his lawyers respond to the interview after it airs will be closely watched.